Steven Johnson has claimed back-to-back Paynter Dixon Touring Car Masters titles at the Coates Hire Newcastle 500. 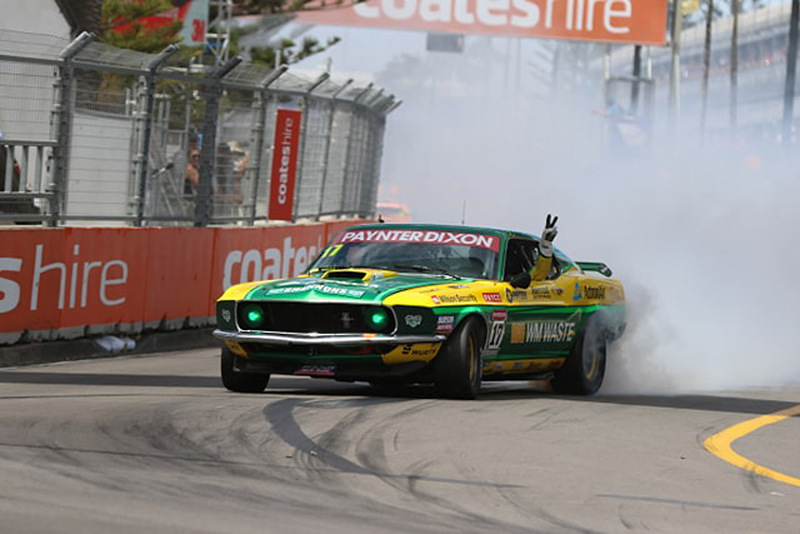 Despite finishing behind series rival John Bowe (Holden Torana) in the final two races of the weekend, Johnson (Ford Mustang) had enough of a points advantage to secure the title by 59 points. Bowe spent the duration of Race 4 challenging leader Adam Bressington (Chevrolet Camaro) for the top spot, with the pair at one stage running side-by-side out of Turn 2. Bressington held strong and took the chequered flag less than half a second ahead of Bowe. Johnson passed Jason Gomersall (Holden Torana) for third early in the piece, settling as the top two duelled ahead. Andrew Fisher crossed the line fifth aboard his Ford Falcon while Ryan Hansford (Holden Torana), who started on the second row, was forced to retire as a result of a broken axle on Lap 1. Race 3 earlier in the day saw Johnson shuffled to sixth on the opening lap while Bressington led Bowe. The Holden Torana driver made a move for the lead at Turn 11, but an issue on the main straight saw Bressington power back past and ultimately take the victory. Bowe was second from Hansford and Gomersall, with Johnson managing to get himself back to fifth at the end of Race 3.